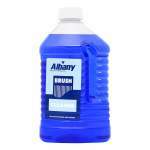 Oil based, high opacity, mid sheen finish for interior wood & metal surfaces. 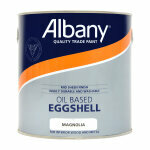 Albany Eggshell is a high VOC content eggshell finish. 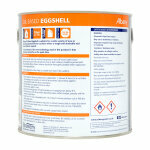 Eggshell is a tough, durable mid sheen finish for wood and metal. It can be applied over most previously painted surfaces without an undercoat. On new surfaces apply over the top of a suitable primer. 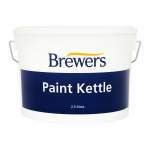 Suitable for a wide variety of new or previously painted interior surfaces where a tough and washable mid sheen finish is required. A characteristic of the new technology used in this product is that whiteness intensifies as the paint dries. 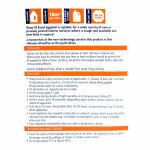 Solvent-based product which is touch dry in 4 hours and recoatable after 16-24 hours. Albany Smooth Durable Eggshell is suitable for a wide variety of new or previously painted interior surfaces where a tough, durable and washable satin finish is required. Stir well before use. Apply by brush or roller. For best results apply 2 coats. Please check for colour accuracy prior to application. C Brewer & Sons Limited is not liable for decorating costs caused as a result of an incorrect colour being applied. Always intermix packs for colour consistency. A characteristic of the new technology used in this product is that whiteness intensifies as the paint dries. 1 litre covers up to 18m2 depending on surface texture, porosity and method of application. In good conditions, touch dry from 6 hours. Recoatable after 16-24 hours. Ensure previous coat is fully dry before application. Where more than 1 tin of coloured paint is being used, intermix and stir thoroughly to ensure uniform colour.